Context: A step-by-step approach to harvesting stem cells from the pulp of permanent and deciduous teeth, the problems faced during culture, and the differences in the growth properties and morphology of cells obtained from both the sources has been discussed as a precursor to the use of these cells in therapy. Aims: To isolate, culture, and study the morphology and growth characteristics of mesenchymal stem cells from the dental pulp of permanent teeth (dental pulp stem cells; DPSC) and exfoliated deciduous teeth (stem cells from human exfoliated deciduous; SHED). Settings and Design : Cell culture study carried out at the Department of Oral and Maxillofacial Pathology, Ragas Dental College and Hospital, Chennai. Materials and Methods: Fifteen permanent teeth and thirteen deciduous teeth from ten subjects were used. The growth characteristics and phenotype of cultured DPSCs and SHED were studied from the fourth passage on 24-well plates. Statistical analysis used : Data analysis was done using SPSS ® version 10.05. Linear regression analysis was performed to derive the slope from growth curves and Mann-Whitney U test was performed to compare the fibroblastoid: epithelioid cell ratio between permanent and deciduous tooth pulp groups. Results: Protocol for the culture of DPSC and SHED was standardized. DPSC and SHED populations were morphologically distinct. The cells from permanent tooth pulp showed a higher proportion of spindle-shaped fibroblastoid cells, whereas deciduous pulp culture showed a higher proportion of epithelioid cells. The seeding efficiency of DPSC - 88.9% (14 th permanent tooth pulp) and 91.7% (15 th permanent tooth pulp) was higher as compared to SHED - 84.25% (10 th deciduous tooth pulp). Conclusions: Permanent and deciduous teeth are both viable sources of stem cells. The permanent teeth were easier to culture because of a lower chance of contamination with oral microflora. 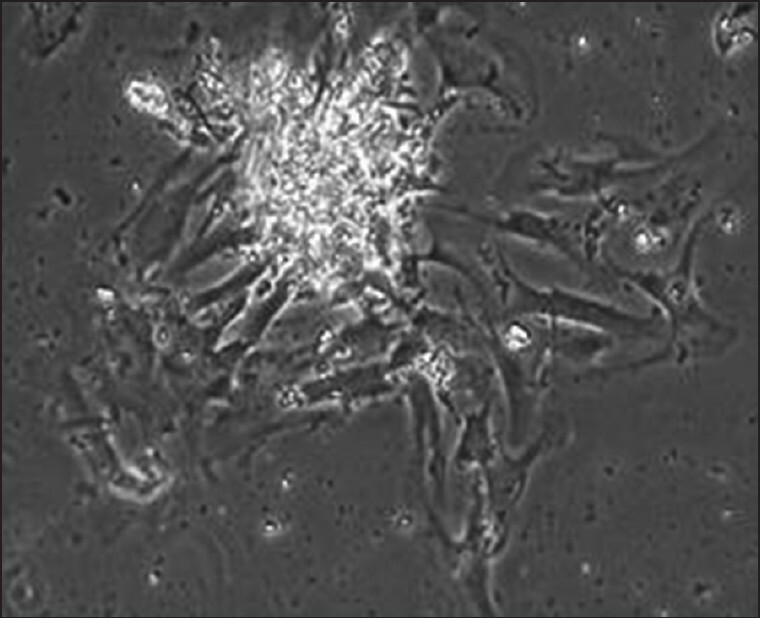 The growth characteristics of the cells obtained from both these sources were similar. However, there was a difference in the ratio of fibroblastoid cells to epithelioid cells between the cultures obtained from the permanent and deciduous teeth. In dentistry, research is focused on the use of stem cells for the regeneration of dentin; creation of biologically viable scaffolds for the replacement of orofacial bone and cartilage  and craniofacial regeneration, including regeneration of the temporomandibular joint;  and regeneration of periodontal ligament and cementum. As dental pulp-derived stem cells produce neurotropic factors, they have the potential to be used in neural regeneration. Clinically, DPSC have an advantage over other adult stem cells in that they are easy to access and can be obtained during adult life. Also, exfoliated deciduous teeth can be secured at a young age and the cells obtained can be stored in a stem cell bank for future use. Various methods are in use to extract dental pulp and expand the stem cell population to viable numbers for storage and clinical use. Here, we describe, step-by-step, our technique for their isolation and expansion from the dental pulp of both deciduous and permanent teeth and discuss their growth properties and morphology, as well as the common problems faced during culture. Fifteen permanent teeth and thirteen deciduous teeth from ten subjects were used in this study. The study protocol was approved by the Institutional Review Board, Ragas Dental College and Hospital, Chennai. Impacted third molars or premolars extracted for orthodontic reasons and extracted, non-infected, exfoliating deciduous teeth were transferred to serum-free α-minimal essential medium (α-MEM), supplemented with antibiotics (penicillin 100 IU and streptomycin 100 μg/ml), at a pH 7.2-7.4 and maintained at 4°C with the help of ice packs. They were transported in leak-proof, sterilized culture vials. The tooth surface was cleaned well by washing thrice with Dulbecco's phosphate-buffered saline (D-PBS), grooves were placed around the cemento-enamel junction with a carborundum disc, and the tooth was split with chisel and mallet to expose the pulp chamber. The pulp tissue was obtained from the pulp chamber with the help of forceps and a spoon excavator (2 mm diameter) and put into 2 ml of mesenchymal stem cell (MSC) medium (Invitrogen, GIBCO) in a Petri dish More Details (60 mm diameter) to avoid drying. The protocol for primary culture of dental pulp cells  was modified. The dental pulp tissue was minced into tiny pieces with a surgical blade and immersed in a mixture of collagenase (2 mg) (type I, filtered; CLS-1™; Worthington Biochemical Corporation) and Dispase ® (1 mg) (neutral protease, grade II; Roche) in D-PBS. It was incubated at 37°C for 60 min and mixed intermittently. The cells were centrifuged at 2400 rpm for 5 min. The supernatant was removed and the pellet re-suspended with MSC medium. The cells were then cultured at 37°C in 5% CO 2 in the incubator. Media change was carried out every third day and cells were subcultured after they had reached 90% confluence. The growth characteristics and phenotype of DPSC and SHED were studied from the fourth passage on 24-well plates. The population doubling time (PDT) was derived from the exponential growth phase of the growth curve. The phenotypic characteristics were studied as follows: ten cells were randomly counted from day 6 for 15 consecutive days and classified as 'fibroblastoid' if they had a spindle-shaped morphology and as 'epithelioid' if they were epithelial- or endothelial-like cells [Figure 1], [Figure 2], [Figure 3], [Figure 4], [Figure 5] and [Figure 6]. Isolation of pulp from permanent teeth [Graph 1] was carried out by using an enzyme solution containing 2 mg of collagenase and 1 mg of Dispase ® in 1 ml of D-PBS for 60 min, agitated every 10 min. The first two cultures did not yield any cells. The third culture was lost to bacterial (gram-negative cocci) contamination. All cell culture glassware and plastics were washed twice and autoclaved. Caps of the vials were wiped with absolute alcohol and flamed before use. The use of cotton wool was discontinued and autoclaved gauze was used for wiping the lamina flow chamber and instruments. The fourth culture from a mandibular third molar yielded epithelioid cells and few fibroblastoid cells as outgrowths on day 6 but then it ceased to grow. We overcame the limited growth by stringent control of the media pH at 7.4-7.7, which is critical to the growth of stem cells. This was achieved by calibrating the amount of carbon dioxide (~5%) in the incubator where the cells were incubated and the constitution (appropriate amount of normal sodium hydroxide added as necessary, 15% fetal bovine serum) of the culture medium. Following this modification, on day 3, four to five cell clusters of epithelioid and fibroblastoid cells as outgrowths were seen [Figure 1] and [Figure 2]. On days 6, 9, and 12, the cells were predominantly fibroblastoid in morphology. The cells reached confluence on day 10, and trypsinization was done on day 11. When the pulp from permanent teeth were subjected to 30-40 min of enzyme digestion in a solution of Dispase ® and collagenase, the cells obtained were very few but, paradoxically, the yield was again low when we decreased the time duration. To address this problem, we used collagenase (3 mg) in place of Dispase ® and dissolved it in the culture medium (α-MEM), rather than in D-PBS, to retard enzyme action and provide a protective effect to the cells. The duration of incubation was increased to 16-18 h to yield a good number of cells. Three out of thirteen deciduous teeth [Graph 2] did not yield pulp tissue sufficient for culture. We found that deciduous teeth have considerably less amount of tissue as compared to third molars and, consequently, need to be subjected to enzyme digestion for a shorter span of time. Pulp obtained from the deciduous mandibular central incisors was disaggregated for 40 min in enzyme solution (2 mg collagenase and 1 mg Dispase ® in 1 ml D-PBS). No cells were seen on days 3, 6, 8, 12, and 18. Pulp obtained from a mandibular canine was disaggregated for 16 h in a single enzyme solution (3 mg collagenase in 1 ml D-PBS). On day 3, three cell clusters of epithelioid cells and fibroblastoid cells were seen as outgrowths. On days 6, 9, and 12, the fibroblastoid cells appeared fewer in number. The epithelioid cells did not increase in number and the cells did not reach confluence. We then attempted the explant/outgrowth technique for deciduous tooth pulp to avoid the risk of losing cells to enzyme action. However, the high concentration of serum and lack of enzyme action predisposed the media to microbial and fungal growth. To overcome this setback we used two simultaneously extracted teeth (canines) from the same subject for a single primary culture. Pulp obtained from two mandibular canines was disaggregated for 5 h in a single enzyme solution (3 mg collagenase in 1 ml D-PBS). On day 3, four to five clusters with fibroblastoid cells and a few epithelioid cells were seen as outgrowths. On days 6, 9, and 12, the cells were predominantly fibroblastoid. This modification resulted in a better yield of cells from deciduous tooth pulp. 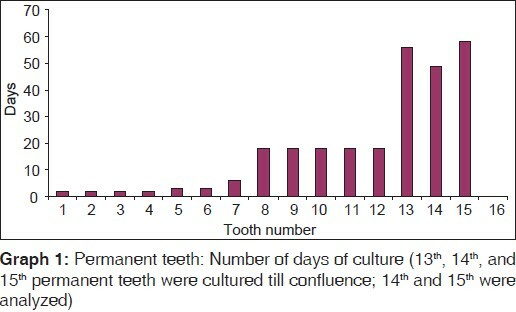 Fifteen permanent teeth were obtained (tooth 1 through 15) [Graph 1] of which two cultures (14 th and 15 th) [Graph 3], [Table 1] and [Graph 4], [Table 2] were propagated optimally to the fourth subculture to plot the growth curve. The cells were seeded at 12 × 10 3 cells/well/ml. The DPSC obtained from the 14 th permanent tooth pulp showed a seeding efficiency of 88.9%. There was a steady increase in the slope of the growth curve from days 1 to 6. 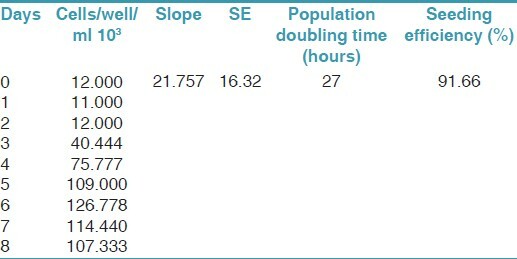 The PDT calculated from the slope of the graph was 26 h. The plateau phase was reached by the 7 th day. The cells from the 15 th permanent tooth pulp showed a steady increase in the slope of the growth curve from days 1 to 8 and a seeding efficiency of 91.7%. The PDT was 27 h, with cells reaching a plateau phase by day 7. 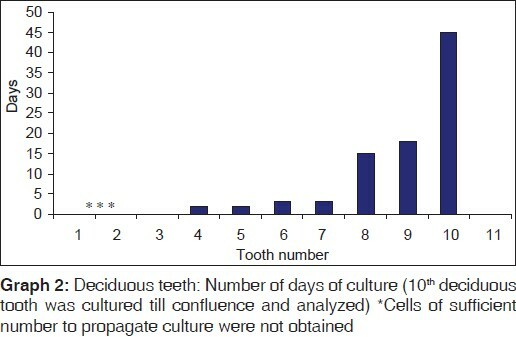 The cells from the third passage of 10 th deciduous tooth pulp culture [Graph 5] and [Table 3] were used to study the growth characteristics of SHED. The initial seeding concentration was 12 × 10 3 cells/well/ml. 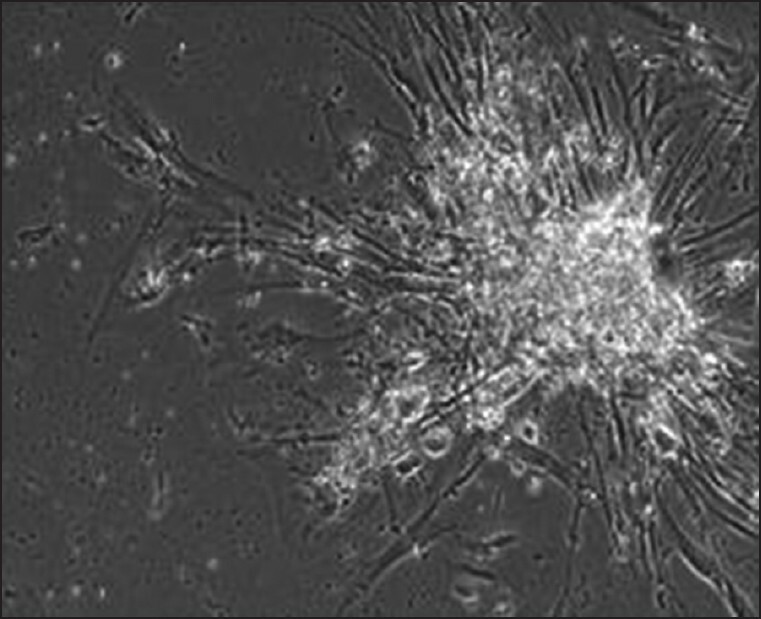 A loss of cells within 12 h of attachment was seen. The seeding efficiency was 84.25%. A steady increase in the slope of the growth curve from day 1 to day 8 was observed. PDT calculated from the slope of the graph was 22 h. The cells reached a plateau phase by the 7 th day. The cells from permanent tooth pulp showed a higher proportion of fibroblastoid cells, whereas deciduous pulp culture produced a higher proportion of epithelioid cells [Table 4]; the difference was statistically significant at 5% level (P < 0.05). Reparative dentinogenesis after tooth eruption, mediated by newly generated odontoblasts that arise from pulp tissue, is indicative of the presence of odontogenic progenitor or stem cells in the dental pulp. Gronthos et al. (2000),  Gronthos et al. (2002),  Shi and Gronthos,  Huang et al. and Miura et al. cultured dental pulp stem cells in media supplemented with 20% FBS, while Suchanek et al. reported using 2% FBS. Serum contains growth factors that promote cell proliferation. However, increasing the concentration of serum also makes the medium more susceptible to microbial contamination. Takeda et al. lost nine DPSC cultures to bacterial/fungal contamination. The dental pulps of impacted permanent teeth are not exposed to oral flora, whereas the pulps of deciduous teeth are potentially contaminated because of bacterial colonization of the resorbed areas. Appropriate disinfection of the tooth (we used D-PBS with double-strength antibiotics) after extraction and prior to isolation of pulp is critical. However, excess of disinfection is detrimental to the vitality of cells. Despite using antibiotics and following aseptic conditions, we lost three of our SHED cultures to bacterial contamination. Thus, one of the issues that determine the use of deciduous teeth is the susceptibility of the culture to microbial contamination from oral flora and the clinical environment. It is important to carefully control the concentration and duration of enzyme disaggregation. If enzyme digestion lasts too long, it is harmful to the cells, and so the duration has to be calibrated to allow for release of cells but not cause damage. Deciduous teeth have considerably less amount of tissue as compared to third molars and, consequently, need to be subjected to enzyme digestion for a shorter span of time. Gronthos et al. (2000),  Gronthos et al. (2002),  Shi and Gronthos,  and Huang et al. used 3 mg/ml of collagenase and 4 mg/ml of Dispase ® for 60 min for digestion of cells from permanent tooth pulp, while Suchanek et al. carried out enzyme disaggregation with collagenase and Dispase ® for 35 min. Miura et al. used 3 mg/ml of collagenase and 4 mg/ml of Dispase ® in D-PBS for 60 min for digestion of cells from deciduous tooth pulp, whereas Freshney et al. recommended 2 mg of collagenase and 1 mg of Dispase ® in D-PBS for 30-60 min. The varying values reported by Gronthos et al. (2000),  Gronthos et al. (2002),  Shi and Gronthos,  Huang et al.,  Suchanek et al.,  Miura et al.,  and Freshney et al. can be attributed to modifications based on differences in the amount of pulp obtained from each tooth. We report here the effectiveness of a single enzyme (collagenase 3 mg) dissolved in (α-MEM) for 16-18 h in case of permanent teeth. The pH of culture medium is critical to the growth of stem cells. The pH is determined by carbon dioxide levels, constitution of the culture medium, and cell metabolism. The percentage of carbon dioxide used was similar to that reported by Gronthos et al. (2000),  Gronthos et al. (2002),  Shi and Gronthos,  Miura et al.,  Huang et al.,  Lopez-Cazaux et al.,  Takeda et al.,  Huang et al.,  and Shuchnek et al. for dental pulp cells. To address the issue of deciduous tooth pulp having less amount of tissue for culture, we used two simultaneously extracted teeth (canines) from the same subject for a single primary culture. This modification helped us obtain a better yield of cells from deciduous tooth pulp. 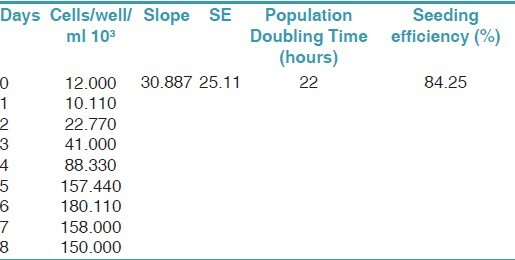 The PDT of SHED (10 th deciduous tooth pulp) that we derived from its growth curve was 22 h. This value is obtained from a single culture (10 th deciduous tooth pulp) and therefore it needs to be corroborated with studies on larger samples. DPSC had a higher seeding efficiency than SHED (DPSC - 88.9% and 91.7%; SHED - 84.25%). Our findings show that DPSC and SHED populations are morphologically distinct. Cells from permanent tooth pulp showed a higher proportion of fibroblastoid cells, whereas deciduous pulp culture showed a higher proportion of epithelioid cells. This difference was statistically significant. Epithelioid cells are considered as contaminating cells during the isolation and propagation of mesenchymal stem cells. The higher proportion of epithelioid cells in deciduous tooth pulp cultures could be due contamination by cells of the periodontium via the open apex of the deciduous tooth. Suchanek et al. reported that SHED generated more rounded cells 'without long processes' as compared to DPSC. Deciduous teeth are significantly different from permanent teeth with regard to their developmental processes, tissue structure, and function. Therefore, it is not surprising to find that SHED are distinct from DPSC with respect to cell morphology. Permanent and deciduous teeth are both viable sources of stem cells. The permanent teeth were easier to culture because of a lower chance of contamination with oral microflora. 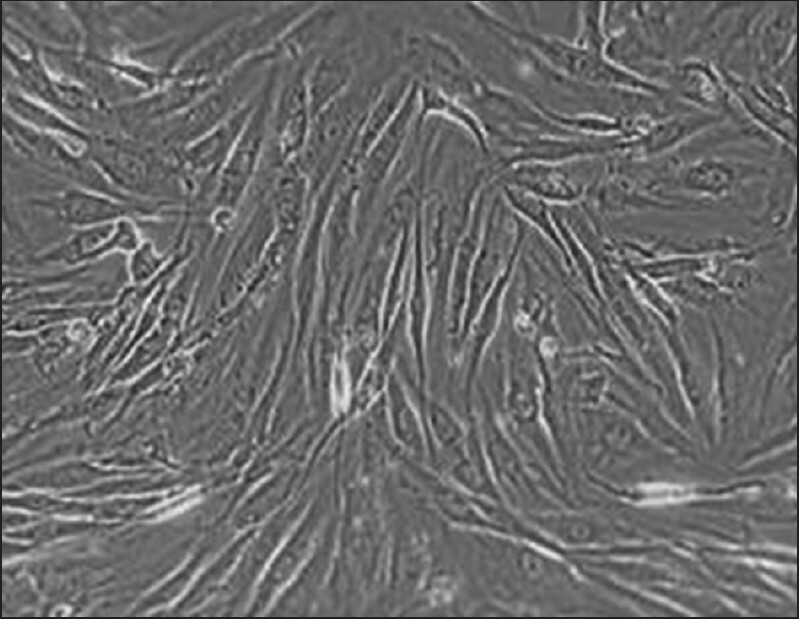 The growth characteristics of the cells obtained from both sources were similar. 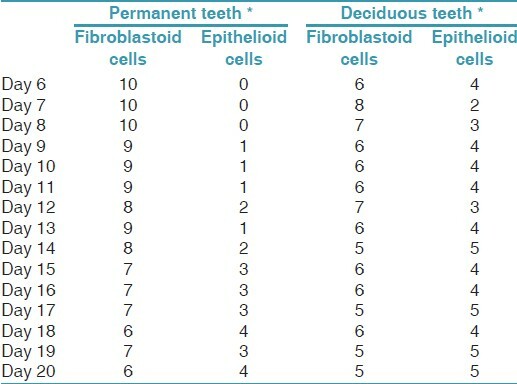 However, there was a difference in the ratio of fibroblastoid cells to epithelioid cells between the cultures obtained from permanent and deciduous teeth. This needs to be studied using specific markers to ascertain if they are indicative of two distinct populations of cells or just morphologic variations representative of different stages of growth. 1. Reya T, Morrison SJ, Clarke MF, Weissman IL. Stem cells, cancer, and cancer stem cells. Nature 2001;414:105-11. 2. Shi S, Gronthos S. Perivascular Niche of Postnatal Mesenchymal Stem Cells in Human Bone Marrow and Dental Pulp. J Bone Miner Res 2003;18:696-704. 3. Bianco P, Robey PG. Stem cells in tissue engineering. Nature 2001;414:118-21. 4. Doherty MJ, Ashton BA, Walsh S, Beresford J N. Vascular Pericytes Express Osteogenic Potential In Vitro and In Vivo. J Bone Miner Res 1998;13:828-38. 5. Fuchs E, Tumbar T. Socializing with Neighbours: Stem cells and their Niche. Cell 2004;116:769-78. 6. Moore KA. Lemischka IR. Stem Cells and their Niches. Science 2006;311:1880-5. 7. Gronthos S, Graves SE, Ohta S, Simmons PJ. The STRO-l+ Fraction of Adult Human Bone Marrow Contains the Osteogenic Precursors. Blood 1994;84:4164-73. 8. Gronthos S, Simmons PJ. The biology and application of human bone marrow stromal cell precursors. J Hematother 1996;5:15-23. 9. Owen M, Friedenstein AJ. 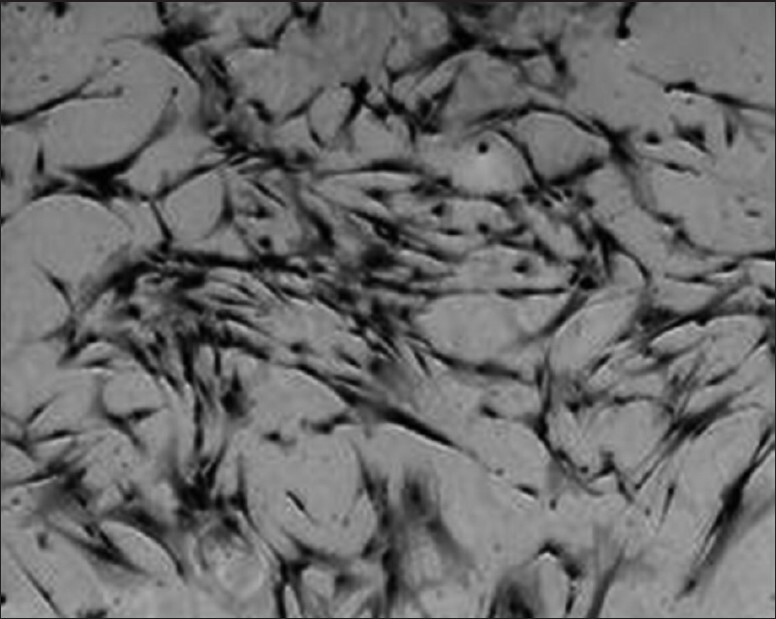 Stromal stem cells: Marrow-derived osteogenic precursors. Ciba Found Symp 1988;136:42-60. 10. Pittenger MF, Mackay AM, Beck SC, Jaiswal RK, Douglas R. Multi-lineage potential of adult human mesenchymal stem cells. Science 1999;284:143-7. 11. Prockop DJ. 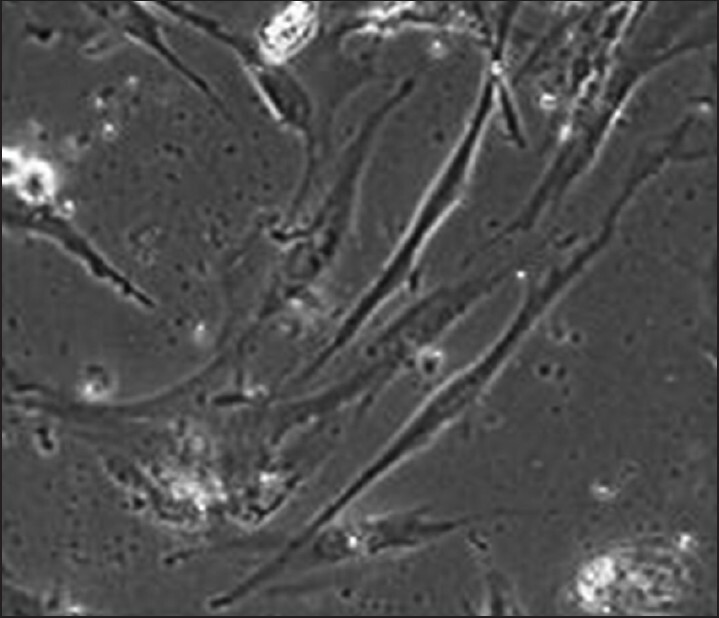 Marrow stromal cells as stem cells for non-hematopoietic tissues. Science 1997;276:71-4. 12. Simmons PJ, Torok-Storb B. Identification of stromal cell precursors in human bone marrow by a novel monoclonal antibody, STRO-1. Blood 1991;78:55-62. 13. Sonoyama W, Coppe C, Gronthos S, Shi S. Skeletal stem cells in regenerative medicine. Curr Top Dev Biol 2005;67:305-23. 14. Friedenstein AJ. 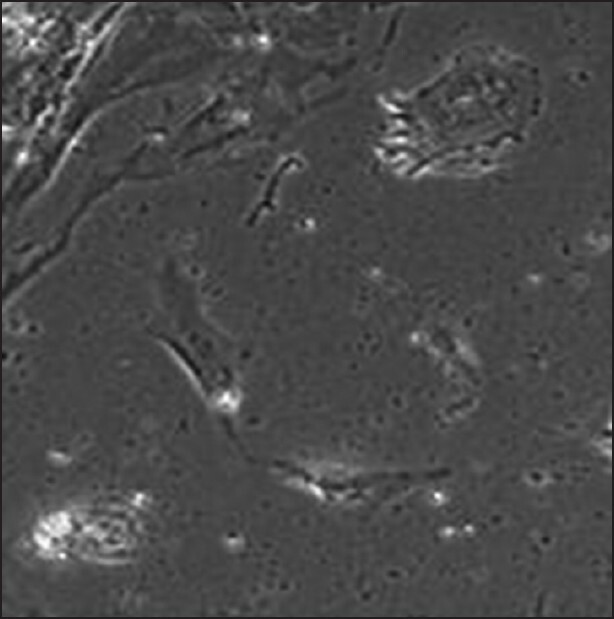 Precursor cells of mechanocytes. Int Rev Cytol 1976;47:327-59. 15. Friedenstein AJ, Chailakhjan RK, Lalykina KS. The development of fibroblast colonies in monolayer cultures of guinea-pig bone marrow and spleen cells. Cell Tissue Kinet 1970;3:393-403. 16. Nosrat IV, Widenfalk J, Olson L, Nosrat CA. Dental Pulp Cells Produce Neurotrophic Factors, Interact with Trigeminal Neurons in Vitro, and Rescue Motor neurons after Spinal Cord Injury. Dev Biol 2001;238:120-32. 17. Nagaya N, Fujii T, Iwase T. Intravenous administration of mesenchymal stem cells improves cardiac function in rats with acute myocardial infarction through angiogenesis and myogenesis. Am J Physiol Heart Circ Physiol 2004;287:2670-6. 18. Gomez JAP, Monterio BG, Melo GB. Corneal Reconstruction with Tissue-Engineered Cell Sheets composed of Human Immature Dental Pulp Stem Cells. Invest Ophthalmol Vis Sci 2010;51:1408-14. 19. Mao JJ, Giannobile WV, Helms JA, Hollister SJ, Krebsbach PH, Shi S. Craniofacial Tissue Engineering by Stem Cells. J Dent Res 2006;85:966-79. 20. Alhadlaq A, Mao JJ. Tissue-engineered Neogenesis of Human-shaped Mandibular Condyle from Rat Mesenchymal Stem Cells. J Dent Res 2003;82:951-6. 21. Seo BM, Miura M, Gronthos S, Bartold PM, Batouli S, Brahim J, et al. Investigation of multipotent postnatal stem cells from human periodontal ligament. Lancet 2004;364:149-55. 22. Freshney I R, Stacy G N, Auerbach J M. Culture of Human Stem Cellls. Wiley- Interscience, New Jersey: John Wiley Inc.; 2007. p. 193-203. 23. Van Wyke CW, Oliver A, Helden CGH, Grobler-Rabie AF. Growth of oral and skin fibroblasts from patients with oral submucous fibrosis. J Oral Pathol Med 1995;24:349-53. 24. Freshney IR. Culture of Animal Cells- A Manual of Basic Technique, 5 th Ed, New Jersey: Wiley -Liss Publication, John Wiley Inc.; 2005. 25. Gronthos S, Mankani M, Brahim J, Robey PG, Shi S. Postnatal human dental pulp stem cells (DPSCs) in vitro and in vivo. Proc Natl Acad Sci U S A 2000;97:13625-30. 26. Gronthos S, Brahim J, Fisher LW, Cherman N, Boyde A, Robey PG, et al. Stem cell properties of human dental pulp stem cells. J Dent Res 2002;81:531-5. 27. Huang AH, Chen Y, Lin L, Sheih T, Chan AW. Isolation and characterisation dental pulp stem cells from a supernumerary tooth. J Oral Pathol Med 2008;37:571-4. 28. Miura M, Gronthos S, Zhao M, Lu B, Fischer LW, Robey PG, et al. SHED: Stem cells from human exfoliated deciduous teeth. Proc Natl Acad Sci U S A 2003;100:5807-12. 29. Suchanek J, Visek B, Soukup T, Omran A. Stem Cells from Human Exfoliated Deciduous teeth-Isolation, Long term Cultivation and Phenotypical Analysis. Acta Medica (Hradec Kralove) 2010;53:93-9. 30. Takeda T, Tezuka Y, Horiuchi M, Honosa K, Tezuka K. Characterization of Dental Pulp Stem Cells of Human Tooth Germs. J Dent Res 2008;87:676-81. 31. Huang GT, Sonoyama W, Chen J, Park SH. In vitro characterization of human dental pulp cells: various isolation methods and culturing environments. Cell Tissue Res 2006;324:225-36. 32. Lopez-Cazaux S, Bluteau G, Magne D, Lieubeau B, Guicheux J, Alliot-Licht B. Culture Medium Modulates the Behaviour of Human Dental Pulp derived Cells: Technical Note. Eur Cell Mater 2006;11:35-42.